Patios, decks, and outdoor spaces with raised beds are a smart way to grow everything from vegetables and herbs to annuals and perennials. Some gardeners prefer to use their raised beds for more permanent plants, like small patio trees and shrubs, or as a landscaping feature for easy-to-maintain succulents and cacti. It's a solution in areas with poor soil, like heavy clay. A raised garden is easier to work on and can ease stress on backs, joints, and muscles that some gardeners experience. It can bring a garden closer to one's living space, making it easier to access and maintain. 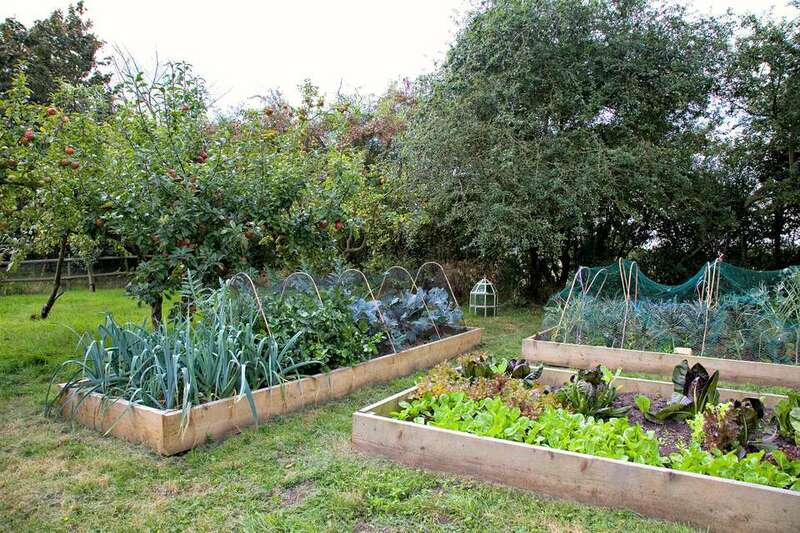 Raised beds are an attractive way to contain a garden and add height to a small outdoor space. Irrigation can be customized for each bed, depending on the plants' growing needs and locations. Drip systems can be installed, or you can simply hand water with a hose. The simplest and easiest way to construct a raised bed is with wood -- experienced do-it-yourselfers can build one in a few hours or less, depending on the size and complexity of the bed. Recommended woods include weather- and rot-resistant types such as redwood, cedar, cypress, composite, or some pressure-treated lumber that has been approved or rated for ground contact. Stay away from wood that has been treated with creosote (like railroad ties) or pentachlorophenol, because these are chemicals that can leach into the soil -- especially harmful if you are growing vegetables or herbs. While brick is more difficult to work with -- especially for the novice -- it helps tie together other areas of the landscape or exterior of a house that also use brick: stairs, patios, pathways, the facade. For a sturdy raised bed made of bricks, a concrete footing or foundation must be built for them to rest or be placed on. Mortar will need to be used between bricks to hold in soil and moisture. For a rustic or natural look, raised beds made of flagstone, dry-stacked rocks or pieces of broken concrete are an informal and sometimes economical alternative. If a bed is low in height (2 feet or so), mortar won't need to be used to adhere pieces together. Another bedding choice is a modular masonry system, usually available in different styles, sizes, and weights. These are a good choice for smaller, freestanding beds. Most feature interlocking concrete pieces to hold them together. Most plants and warm-season vegetables will need at least six hours of sunlight per day, so keep this in mind when you are in the planning stages of building a raised bed. Rectangular beds should be oriented with their long sides running north and south to capture the maximum amount of daily rays. An advantage to finding a sunny location: organically rich soil warms up quickly, produces a more bountiful crop of veggies and herbs, and provides better drainage. Unless you plan on climbing into the bed to pull weeds and dig in the soil, design a raised bed so that it is about an arm's length in depth (or width), which would be about 4 feet Since the point is to elevate the gardening space off the ground, plan on a minimum of 10 inches in height. If the edge of the bed will also serve as an outdoor bench, plan on building it 18 inches from the ground. Length will be determined by the amount of space in your yard or on your patio, but 8 to 10 feet is ideal. For multiple beds, design paths between them to measure at least 2 feet wide. One of the perks of having a raised bed in your yard is the possibility of controlling the wildlife that munches on and destroys your prized plants. Have you ever grown big, red tomatoes, letting them get redder and riper on the vine, only to go outside one morning to find that some discriminating creature has taken a bite out of it, probably spit it out, then went on to see what else is being offered at your backyard buffet? To keep your beds low maintenance, choose plants that are disease resistant and are not attractive to animals and insects. Maintain a healthy garden by using fertile soil, the right amount of fertilizer, irrigation, and sun or shade. Group together plants with similar needs. Before resorting to pesticides (often the last resort), try using organic methods, like barriers, a good blast from the hose, or sprays made from non-toxic household products. These underground miscreants can tunnel through the .soil, munching on bulbs and shoots. If this scenario occurs in your raised bed, place root balls in wire cages or line planting holes with barriers of hardware cloth. Use 3-inch-high copper bands to enclose vegetable and flower beds. Believe it or not, the copper emits a small electrical shock when a snail or slug touches it, making it retreat (not enough to kill it). Another method is to fill a shallow bowl with beer, dig a small hole so that the bowl's lip is flush with the top of the soil. Snails and slugs are attracted to the beer, will go swimming in it, and drown. Protect vegetable leaves from flying and crawling insects by covering them with gauze. Find it at garden centers or online retailers. One of the advantages of building a raised bed is to create an environment with great soil -- something that is not often found in the ground where we live. It's kind of like starting out fresh, with new, clean soil and amendments to grow an abundance of vegetables and flowers. You can use planting mix or topsoil, and some places will deliver it. If your property is blessed with good soil, use some of it in the raised bed, mixing in equal parts of the soil and organic matter such as compost.